Performances by MisterKay, DJ Grid, Bitter Truth and more! VIP Tables and Bottle Service: Call (801) 231-3096 to reserve your table before it’s sold out! 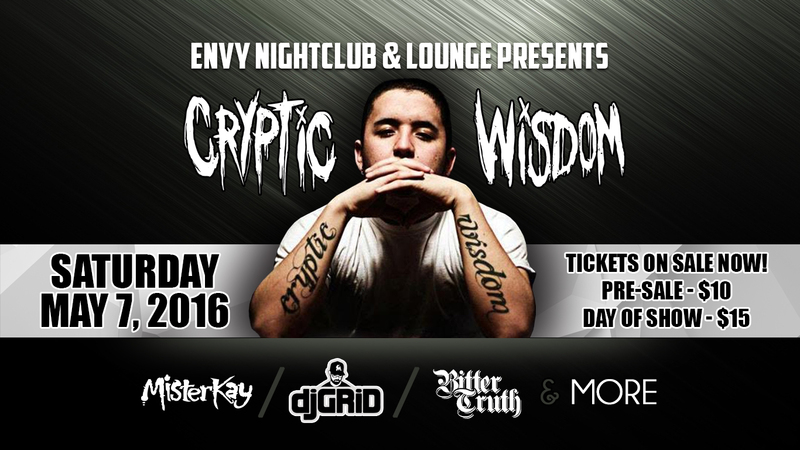 Cryptic Wisdom is a mixture of grungy alternative rock and poetic hip-hop music. He utilizes the power and influence of emotion in music to tell stories and teach life lessons. He believes in being yourself and not caring about what other people think. Cryptic Wisdom’s music has touched thousands of fans around the globe and helped them by being a guiding light in times of strife and struggle. He has gotten countless messages/emails/comments from fans telling him that he literally saved their lives with his music by helping them deal with heartbreak, loss, pain, drug addiction and many more every day issues. His music will emotionally resonate within you by letting you know you are not alone in life and that someone has felt just like you. Cryptic Wisdom isn’t just an artist. He is a sonic soundtrack to life.